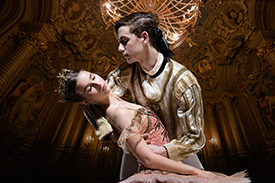 English National Ballet and English National Ballet School present a new version of the much-loved fairy-tale ballet, Sleeping Beauty, as part of its My First Ballet series created especially for children, as young as three. Adapted to an hour in length and with a narrator to help young audiences follow the story, My First Ballet: Sleeping Beauty is the perfect introduction to the magic of ballet. My First Ballet: Sleeping Beauty opens at The Peacock, London on 16 April until 27 April before embarking on a tour to Wycombe Swan, High Wycombe (4 & 5 May), Richmond Theatre, Richmond (18 & 19 May) Manchester Opera House, Manchester (25 & 26 May), New Theatre, Oxford (31 May – 2 June) and Assembly Hall Theatre, Tunbridge Wells (8 & 9 June). Young audiences across the country can therefore enjoy the production and get a taste for ballet. Featuring choreography by Antonio Castilla, English National Ballet’s Ballet Master and Repetiteur, and Dramaturgy by Lou Cope this new version follows the familiar story of Sleeping Beauty, but with a difference. The My First Ballet series is performed by students of English National Ballet School, providing them with valuable rehearsal and performance experience within a professional touring company. Since its creation in 2012 the My First Ballet series has been enjoyed by over 290,000 people. The series has included the hugely successful performances of My First Ballet: Cinderella, Swan Lake and Coppelia. To coincide with My First Ballet: Sleeping Beauty, English National Ballet will host on-stage creative dance workshops, aimed to provide a gateway into the world of ballet. Children and their parents/guardians will have the opportunity to learn extracts from the production and bring the characters to life with English National Ballet dance artists and get up close to costumes and scenery. Next Next post: Dance On!